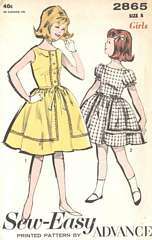 Vintage Advance sewing pattern 2865. Dress with gathered skirt and back buttoned bodice. Sleeveless or short puffed sleeves with elastic. Self fabric tie belt. Girls' Size 8; Breast 26; Waist 23; Hip 28.